Hi beautiful friends! I’m so honored to have you over for a little holiday hangout sesh. 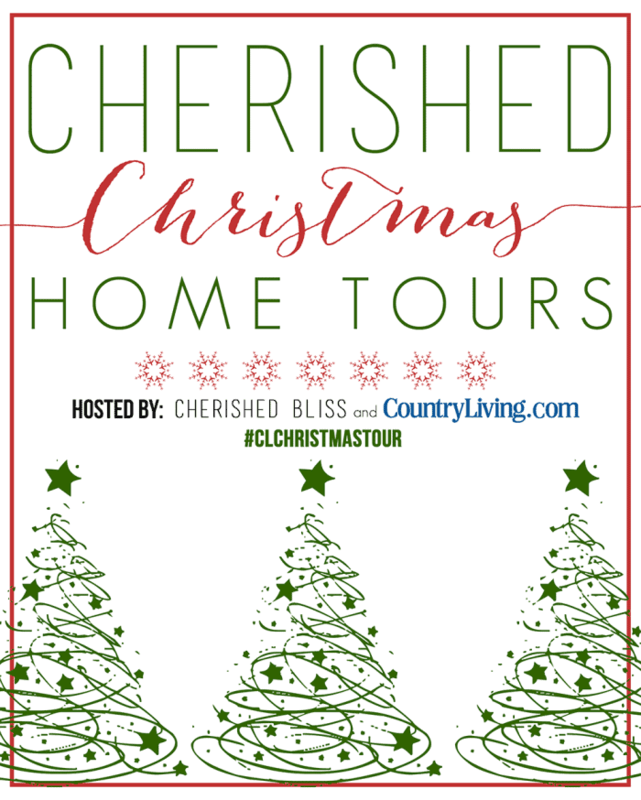 If you had told me a year ago that I would be a part of a Christmas home tour with Country Living Magazine, I would have snort laughed. Seriously. 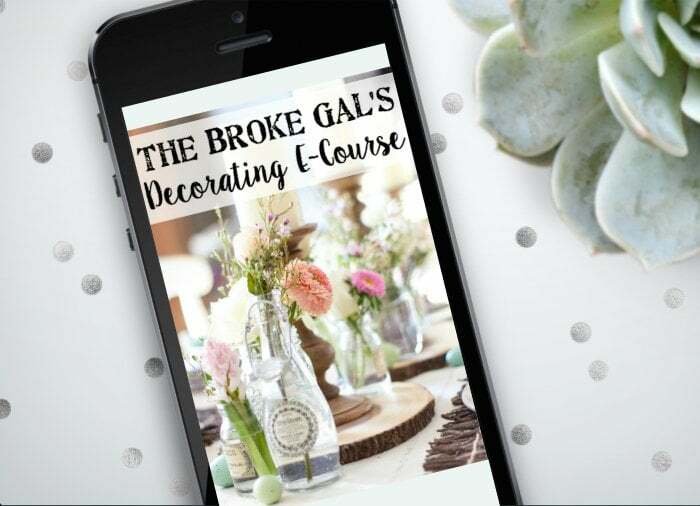 I am absolutely humbled to be a part of this incredibly talented group of home decor bloggers. Ashley from Cherished Bliss was so gracious to invite me and my house along for the ride. If you’re stopping in from Shannon’s lovely abode at AKA Design, I’m so glad to have you here! Please accept this giant virtual cup of hot cocoa and stay awhile. Wink wink. I guess since you’re walking through the front door right now, I should tell you I am not a gal with an interior design degree or a bank account full of home decor spending money. 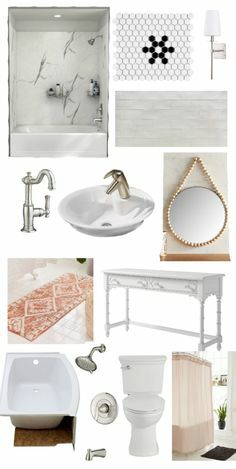 I’m a stay-at-home mom with a slight Fixer Upper / Pinterest addiction and a determination to make our suburban stock builder home a modern farmhouse with as little money as possible. So far, the thrifting marathons and naptime makeovers seem to be working out for us. It’s amazing how God can show you abilities you never knew you had when you’re faced with a challenge, right? Our journey in our home has definitely brought our family even closer together and has made us even more grateful for what we have. My husband Robert, three year-old daughter Olivia, and I have had so much fun making this first house of ours into something we are happy to share with friends and family. We moved into this house exactly two years ago almost to the day, and our foyer certainly looked nothing like this. 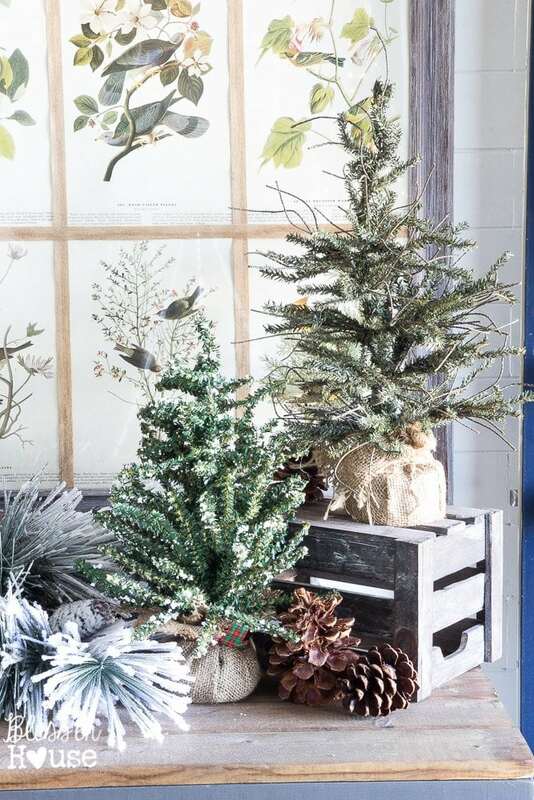 Pretty much any time of year, if you pop in for a visit, you’ll see greenery in every room. It’s my favorite way to make a room come to life. I sort of went crazy with it in here. I find Olivia playing with this typewriter pretty much every day, and she gets a good giggle out it. Beside the foyer, our dining room is a spot that we only use on special occassions. Birthday parties, family gatherings, holidays all happen in here. 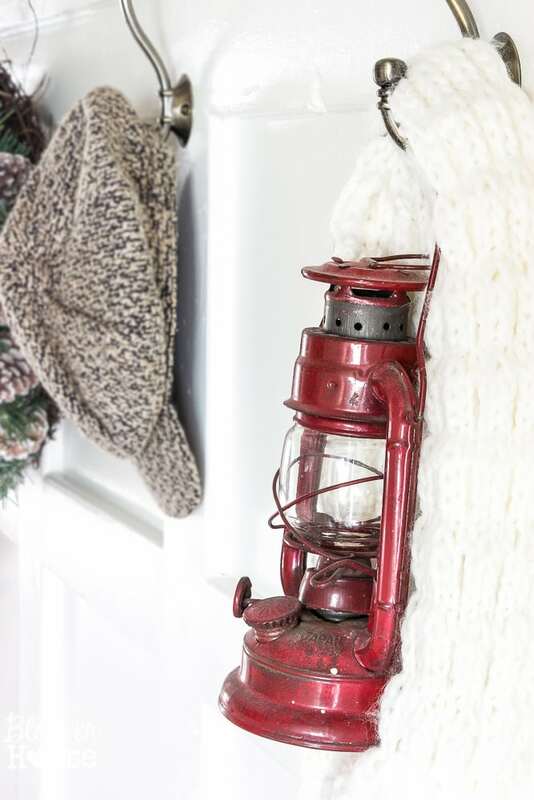 I love that so many hand-me-downs from my grandmothers have found a home in this space. 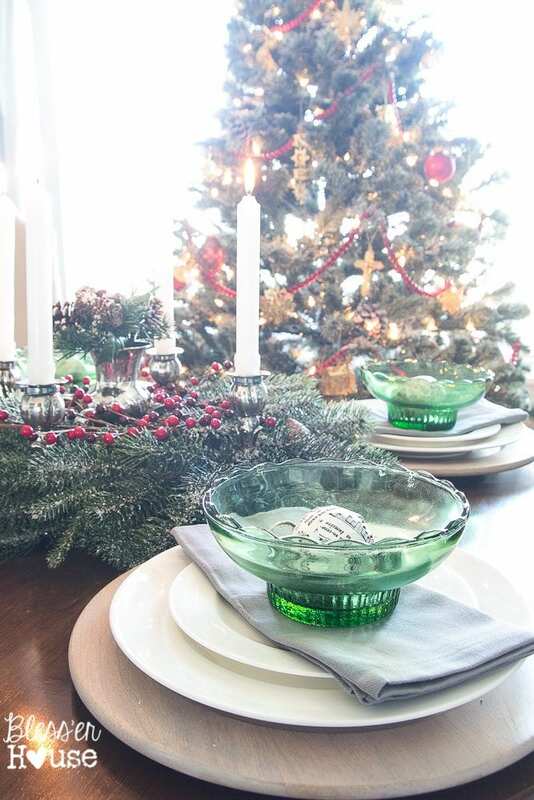 My paternal grandmother’s side of the family came from Sweden, so I pulled together this centerpiece to resemble St. Lucia’s Day in honor of her along with my maternal grandmother’s Depression glass. 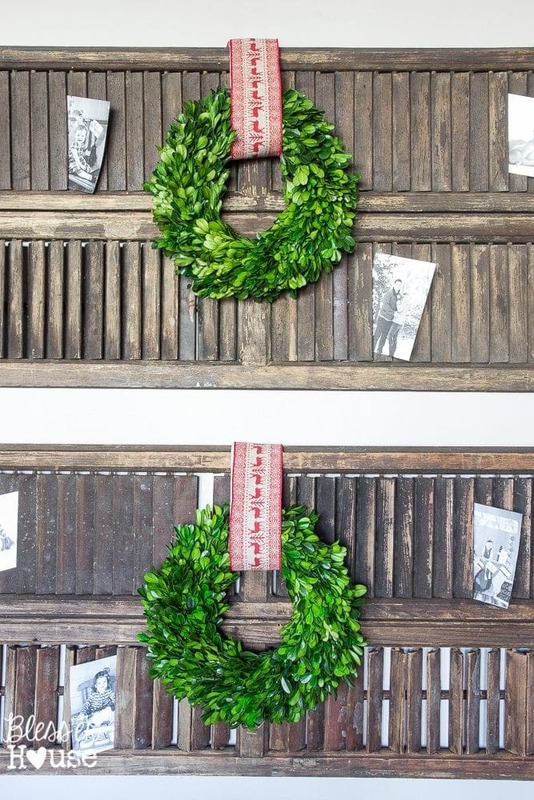 I love using lots of texture on our walls, and these old shutters a friend gave me work so well as picture holders for photos of past Christmases. And of course, I had to put one up of me and my main squeeze. Robert is the kind of guy who can still play like a little kid, build like a handyman, talk to you like a best friend, prank you to the verge of driving you crazy, and then sweep you off your feet all over again…or maybe that’s just me he does that to. 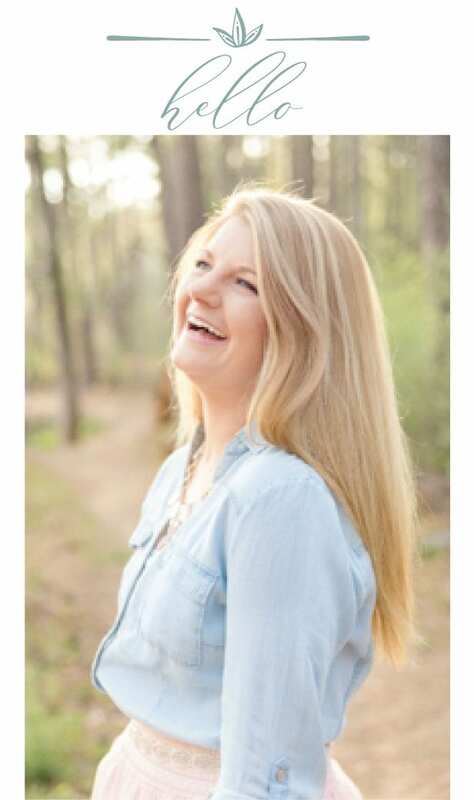 I don’t know how I ever got so lucky. Down our hallway we have this makeshift mudroom where we can toss our winter gear and shoes. We’ve started a new tradition this year with this DIY advent calendar that I made using leftover craft supplies. Olivia loves getting her chocolate fix from it everyday (what girl doesn’t?) and we read the scripture inside together when Robert comes home from work each evening. Can you believe this old wagon bench was $35 on Craigslist? Best. score. ever. Across from the hallway bench, we hung up this old window that we pulled out of my in-law’s barn. This once hung in Robert’s childhood home that was built in 1904. All it needed was some chalkboard paint. Voila! 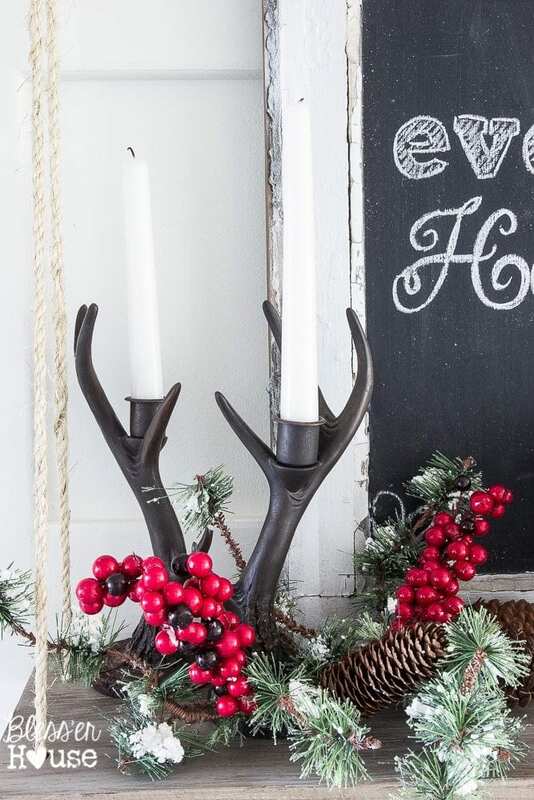 And my mom gave me these deer antler candleholders because they reminded her of me. She’s my bestie. I don’t think I’ll ever be able to part with my chalkboards. They’re so easy to update throughout the year. My handwriting looks like our three year-old’s though, so I use this trick to make it all snazzy. Our kitchen will be getting a makeover in the spring (fingers crossed!) 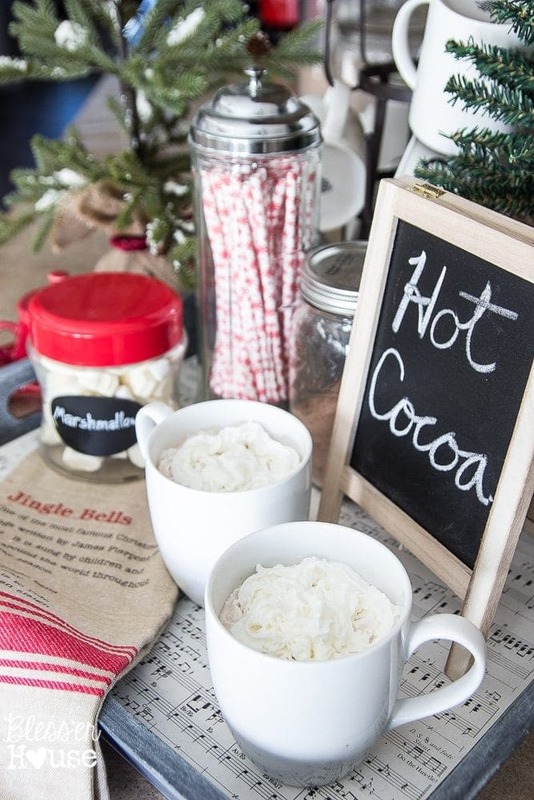 but I gave it some lovin’ with a small hot cocoa bar. Our kitchen and breakfast room open up to our living room, and it’s always great for having lots of company over. Although, most days, those white dishes and driftwood chargers are often replaced with sippy cups and Play-Doh. Ever since we installed that $80 wood beam and our DIY faux fireplace, our house has been completely transformed. 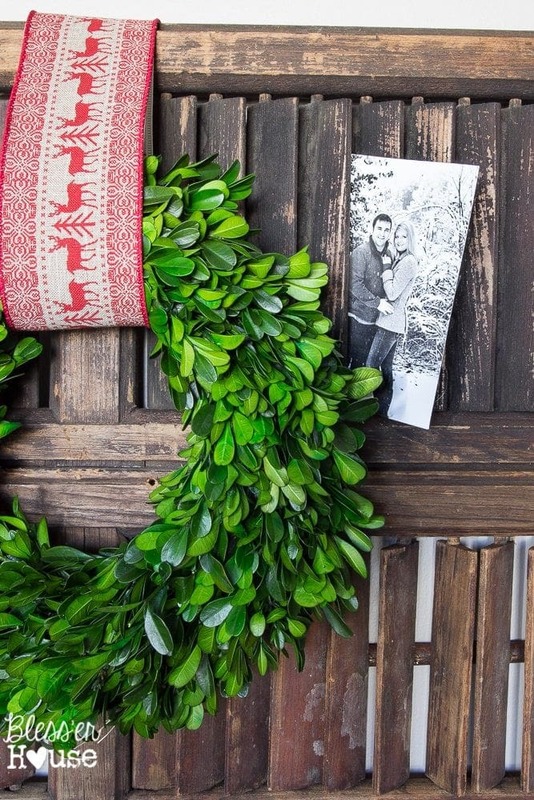 Robert wanted to hang garland from the beam this year, but we had a budget to consider. 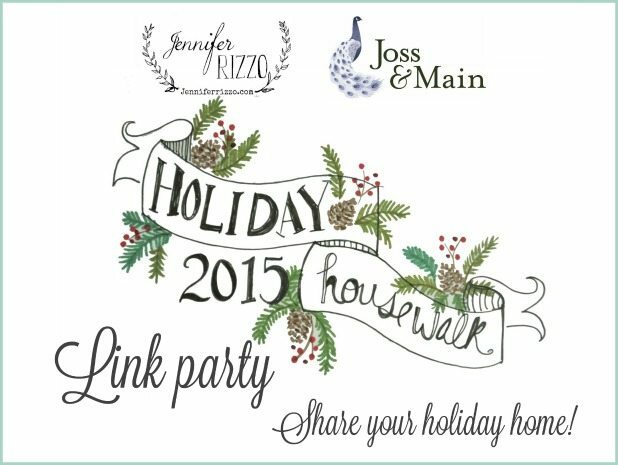 We get giddy-goofy-dancing-level excited about busting out the decorations. 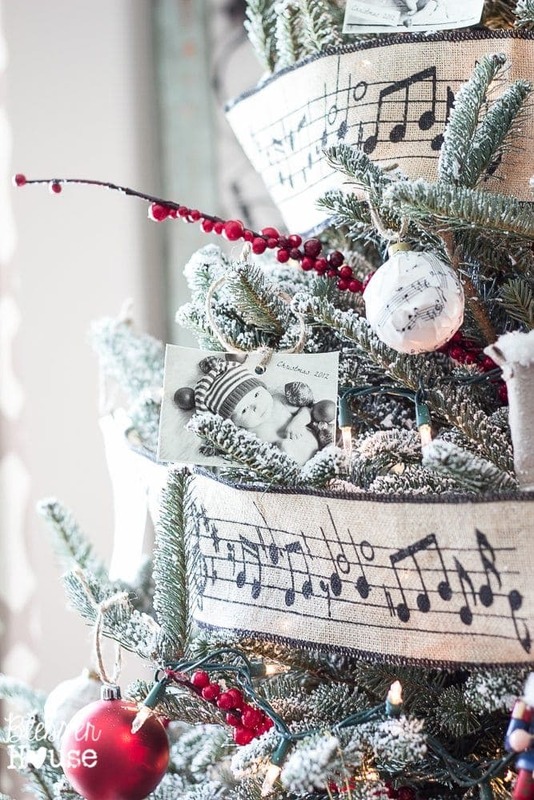 I had a bunch of cheap glass ornaments and a stack of old sheet music lying around, so I just used a bottle of Mod Podge to make these sheet music ornaments. 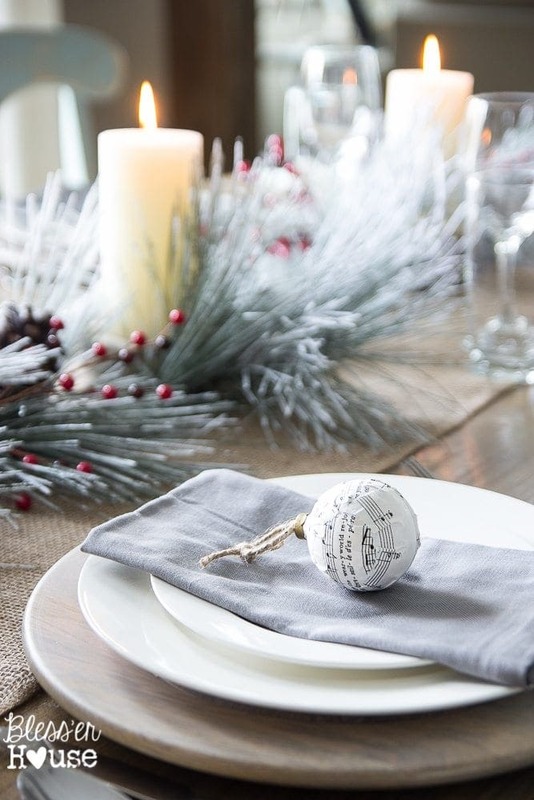 I use them everywhere- bowl fillers, place setting decor, nestled between garland, you name it. Oh, and on our tree of course. This year, I was determined to replace some of our pipe cleaner looking garlands (that probably should have been tossed years ago), so I hit the stores early in November for the 60-70% off decor sales. Ya know, when you’re wondering who are these crazy people buying Christmas stuff around Halloween? Yeah, that’d be me. It’s cheaper then. Because well…apparently there are only a handful of Buddy the Elf types who do that. 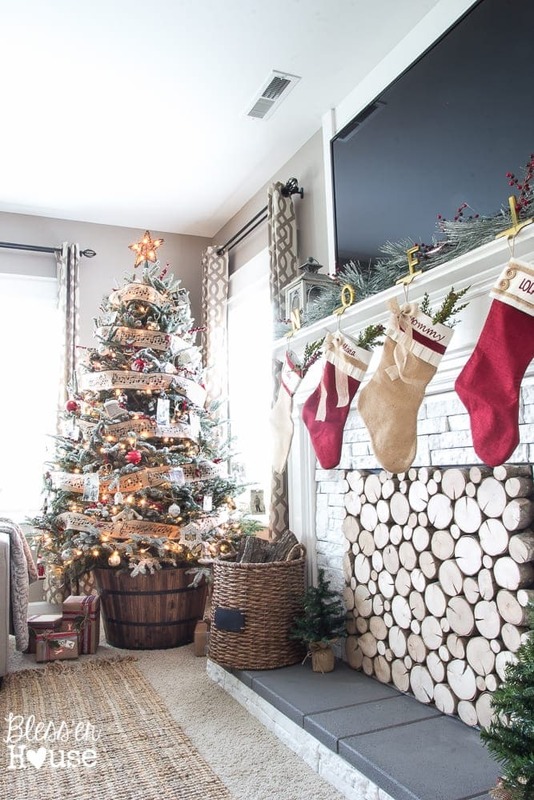 One of the biggest reasons we built this faux fireplace in our living room last summer was so we could hang our stockings. 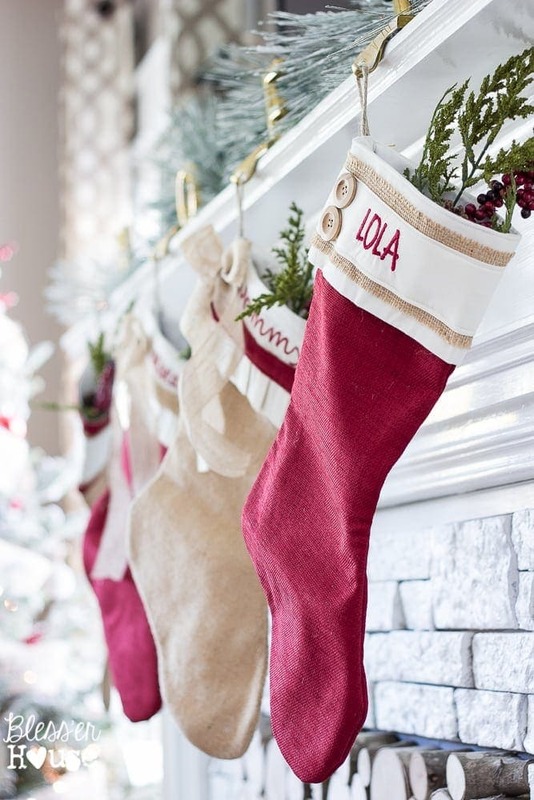 Because it’s totally normal to be thinking about Christmas stockings in June, right? It was the first project we thought up when we moved in December 2013, and it was pretty much the one that started it all. Oh, and our moody Yorkie-Schnauzer Lola gets a stocking too. Even if she does terrorize the UPS guy. She thinks she’s big and bad. 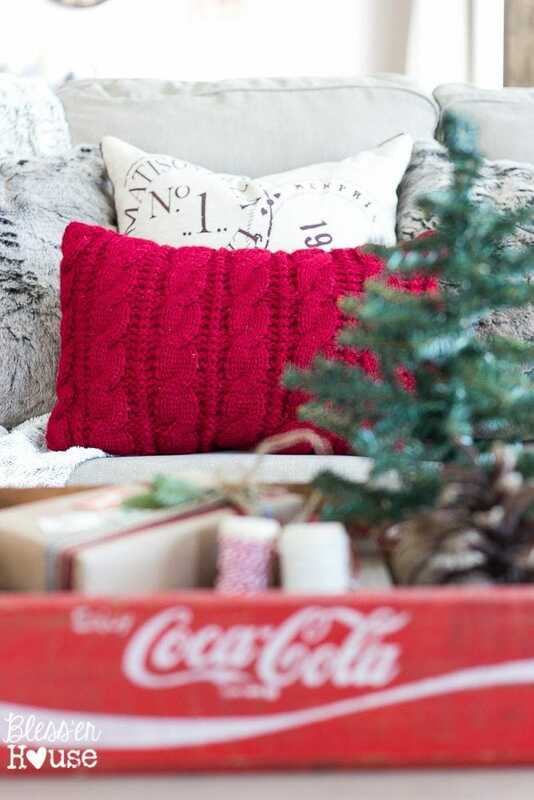 We’re usually a neutral lovin’ crowd around here, but I love busting out the red this one month of the year. It just wouldn’t feel like Christmas to me without red. This Coca-Cola crate I found while out thrifting likes to make an appearance around July 4th too. 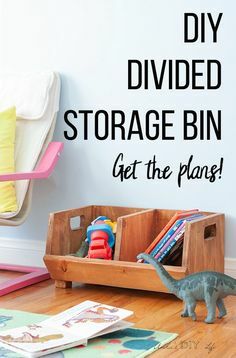 It’s perfect for holding odds and ends that often show up on our coffee table. I picked up a bunch of little Christmas trees at the Target Dollar Spot on the cheap too. 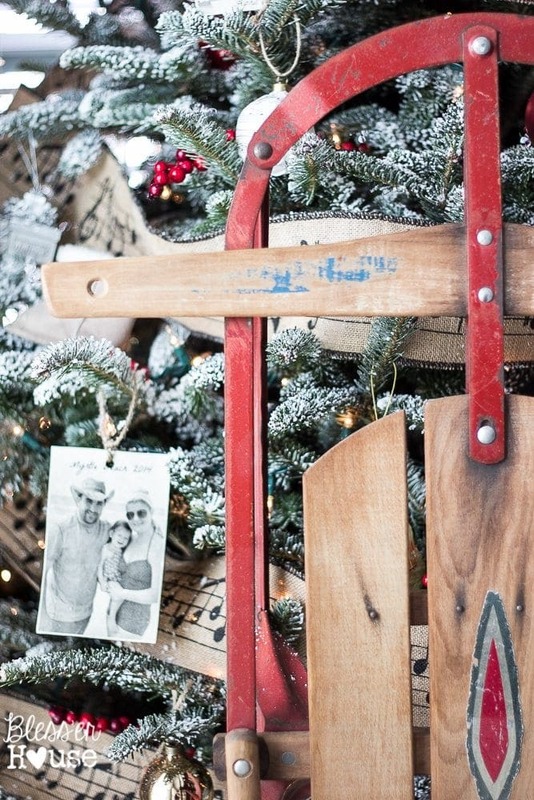 We’re still working on decorating our front porch, where this old sled will most likely end up. It seems right at home leaning against our tree though. I love figuring out ways to use sentimental items in our house, and this is one of my favorites. It was my mother’s (and I think even my grandmother’s) growing up. Since we live in South Carolina, we only get usually one good winter storm each year. When I was little, my brother and I took every opportunity we could to zoom down the hills in our neighborhood on this baby. We kept our tree mostly the same as last year’s with lots of homemade ornaments that are a reflection of our family. There are a few dollar store decorations in there too. I wound a couple of spools of burlap ribbon around it that I found on clearance a few years ago. Robert always wants a real tree every year (I told you, he’s a Christmas-loving little kid), so this year we got one of the first picks on the lot. 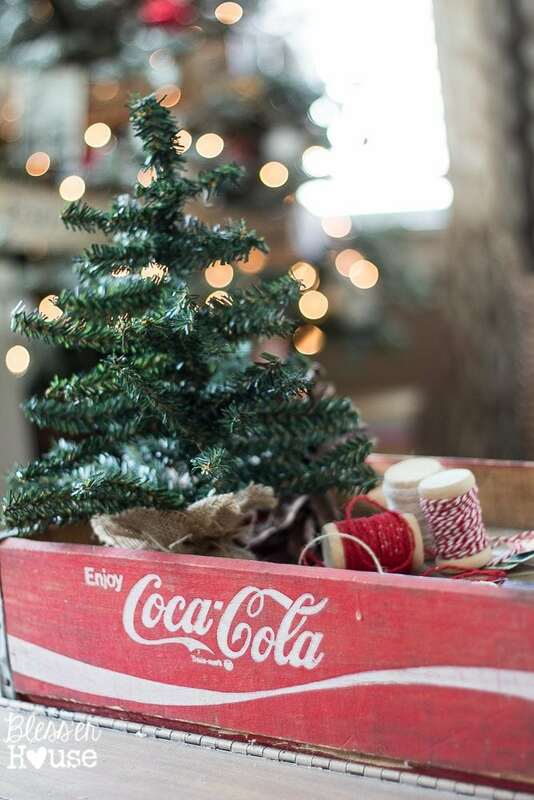 We skipped the tree skirt and used a wood barrel planter instead, then “flocked” it with just a couple of $1.50 cans of canned snow from Lowe’s. I think we’re officially addicted to this stuff. If you stand still too long, you might get snow-canned. Isn’t it purrrrdy? Magic, I tell ya. 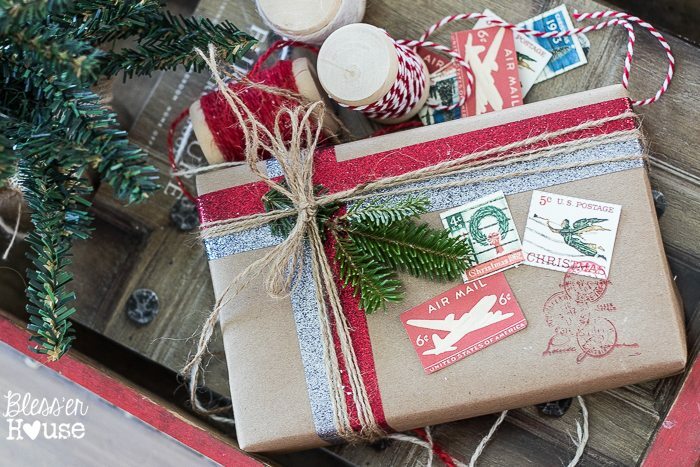 I’ve loved wrapping up presents in pretty ways ever since I was little, and year-round I often use brown shipping paper to embellish for the occassion. You can see more about it here. The stamp printables are from Vintage Fangirl and Graphics Fairy. Oh and this is my little helper elf. Teehee! 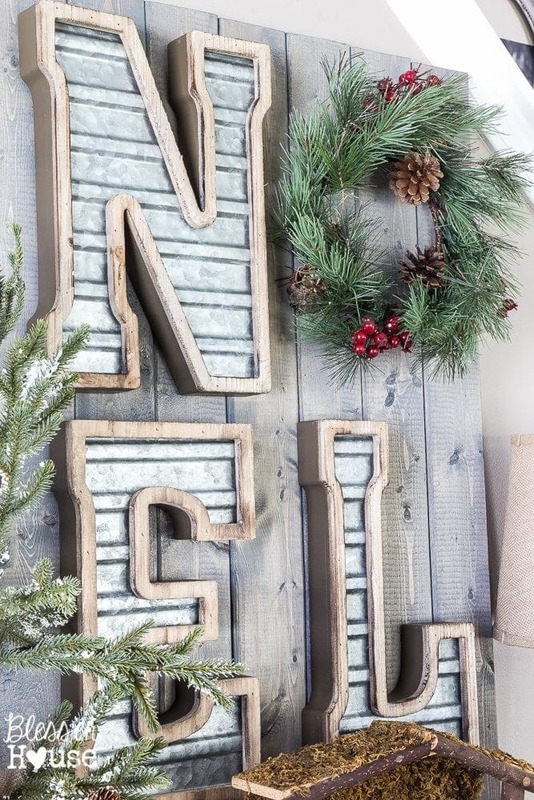 We often have a lot of scrap wood from leftover projects hanging out in our garage, so I whipped up this wood and metal noel sign for our living room media cabinet. I love how it turned out! Robert found this nativity scene at an antique shop last year. The birth of our Savior is what it’s all about. I love being able to pass down the Christmas story to Olivia and tell her all about little “beebee Cheese-us” (that’s how she says it). 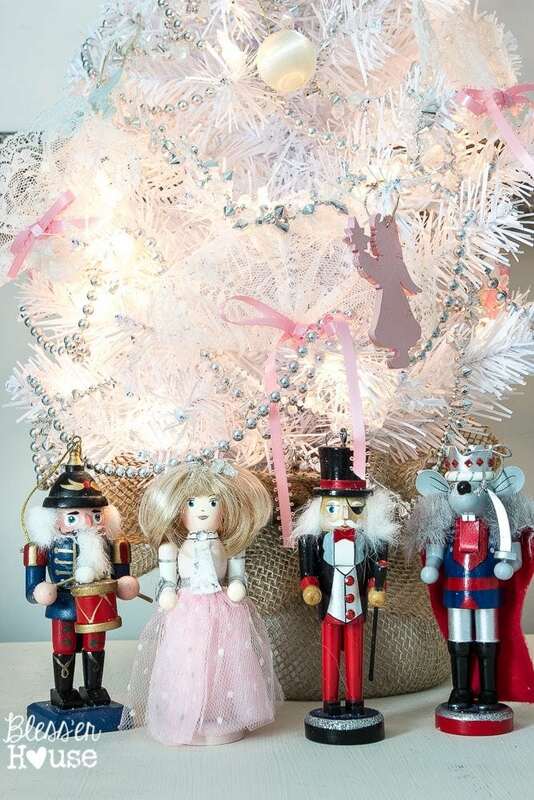 Up in Olivia’s bedroom, I used her ballerina theme as a jumping off point for The Nutcracker. I danced that ballet so many times that I still cringe to this day hearing Tchaikovsky playing at the mall, but my love for the story will never fade. We twirl all around this room together, per her request…which is pretty much 24/7 if she had it her way. 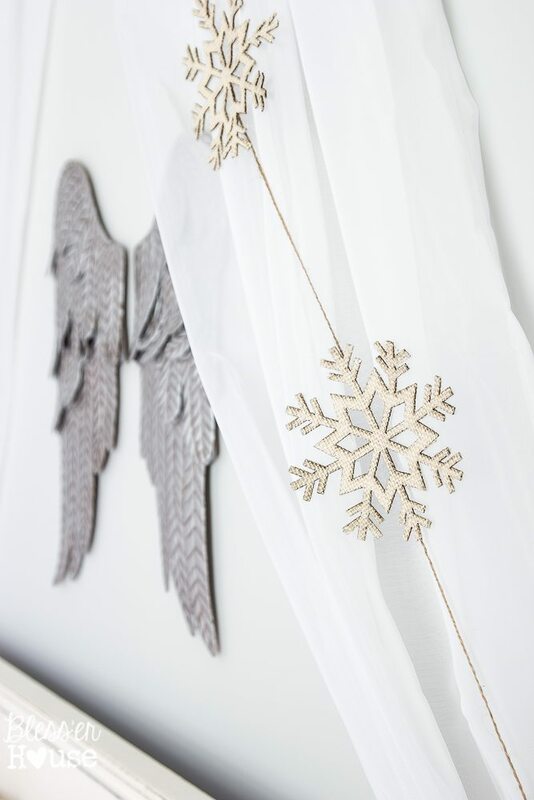 I picked up these burlap snowflakes from the Target Dollar Spot to string together for her canopy. I might even add fairy lights behind it eventually. I passed down all of my decorations to her that once hung on my own Christmas tree in my bedroom as a little girl. I collected the nutcracker dolls in my dancing years too, and they seem totally content on her dresser. Although, Olivia is scared to death of that Drosselmeyer one, so I have to hide it usually. Haha! 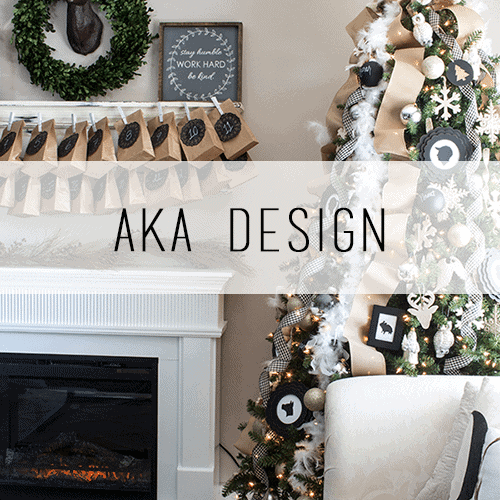 Next week, I’ll be sharing a bit more of our house all done up for Christmas in the 12 Days of Christmas Tour of Homes with Evolution of Style. But as you leave today, I hope you take the time this year to truly experience Christmas for its true beauty. 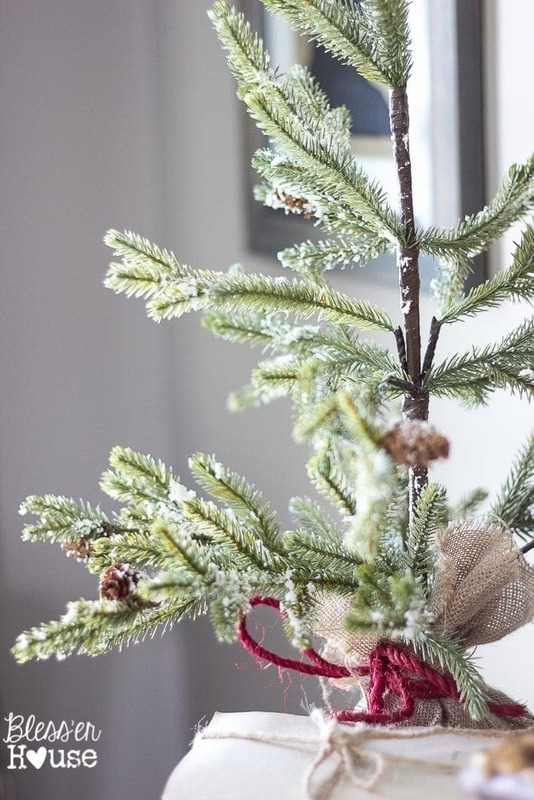 It’s never about buying the presents or decorating every nook and cranny of your house. I hope, most of all, that you are present and take time to enjoy your family. I hope you give, even if you can only afford giving your time, to those who need it. I hope you are the light this world so desperately needs and find ways to spread kindness in even the smallest ways. And I hope, through the hustle and bustle, we remember the One who is our constant redeemer and makes it all possible. It was a pleasure having you here, friends! 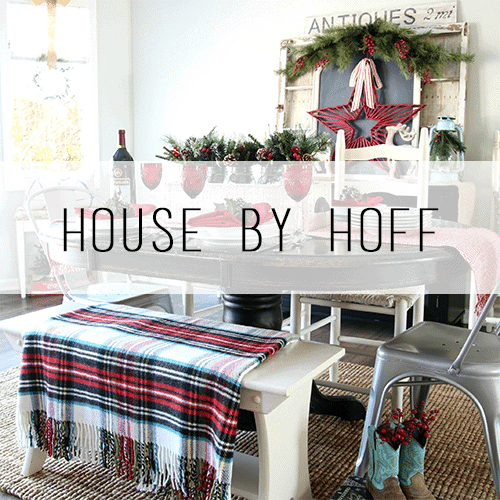 You can continue the tour over at House By Hoff, where I’m sure April has all kinds of inspiration. Or you can start the tour from the beginning and see the full line-up at Cherished Bliss if you missed any of them. 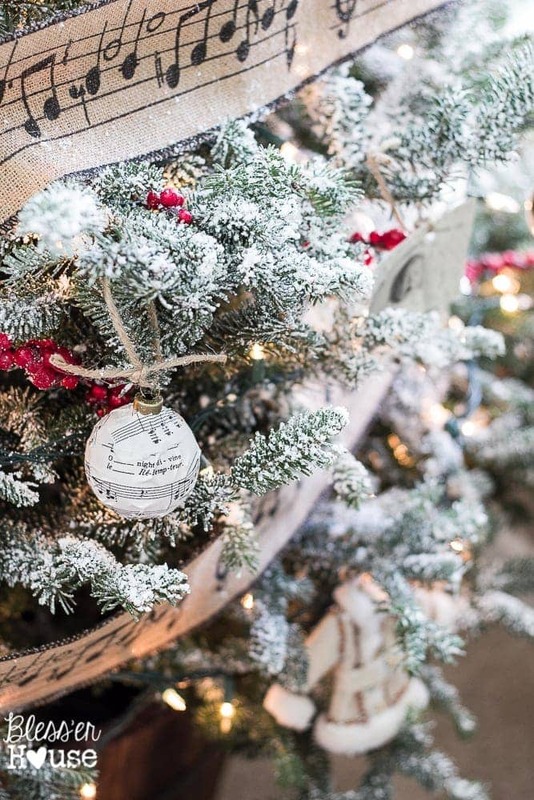 Be sure to join in on the party over on Instagram with us and Country Living Magazine to share your own Christmas decor. Just use the tag #CLChristmasTour as we’ll be choosing favorites to feature throughout December! *Affiliate links are provided in this post for convenience. For more information, see my full disclosure here. So beautiful and magical, Lauren. I love that shutter idea. As a new blogger, it is so inspiring to see how far you have come in a year. You are truly talented. 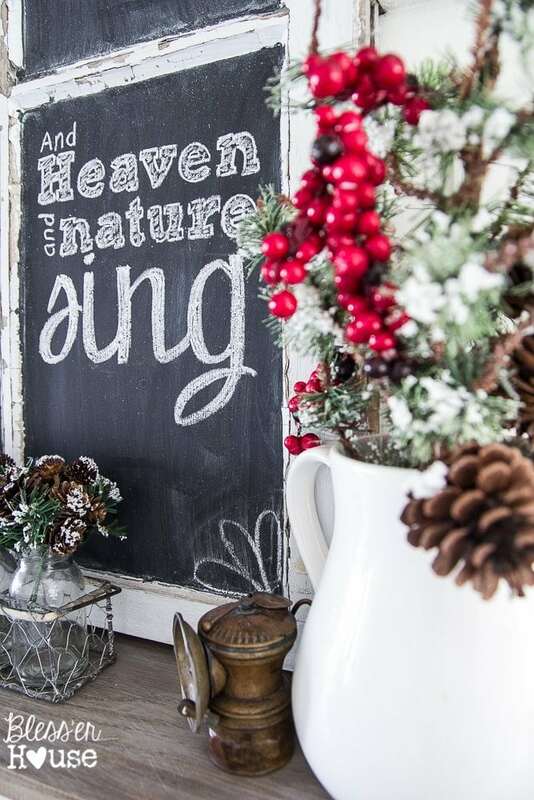 Love, Love, Love your home all decorated for Christmas!! 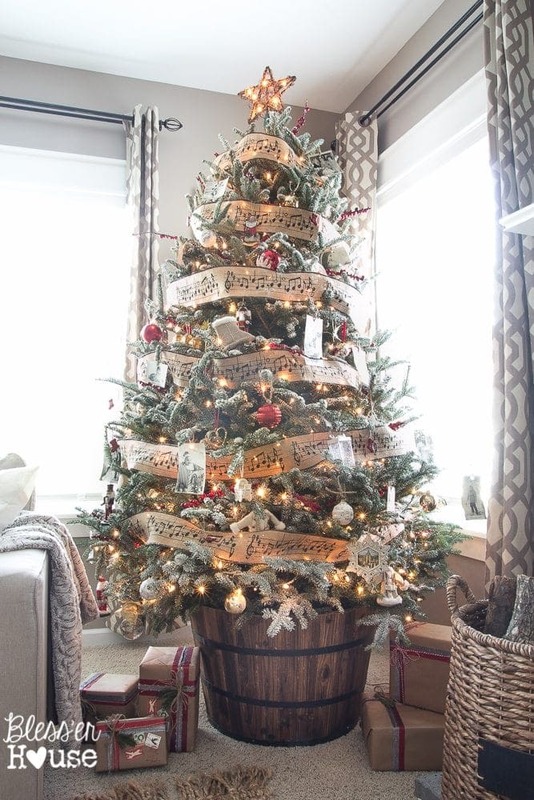 Not sure what I would pick for my favorite….probably the Christmas tree in the Wood Barrel Planter!! Everything looks wonderful, as usual! Thanks for sharing your heart, too – it’s always a great reminder to remember the real reason for the season and the many blessings that God has bestowed on us. 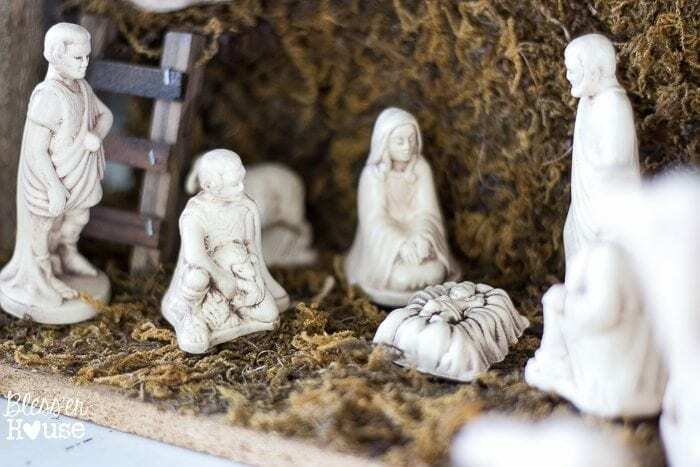 My boys loved the nativity each year….my oldest son called it “Mary’s Barn” and my youngest son called it the “activity”, but both of them loved arranging the holy family and the animals! 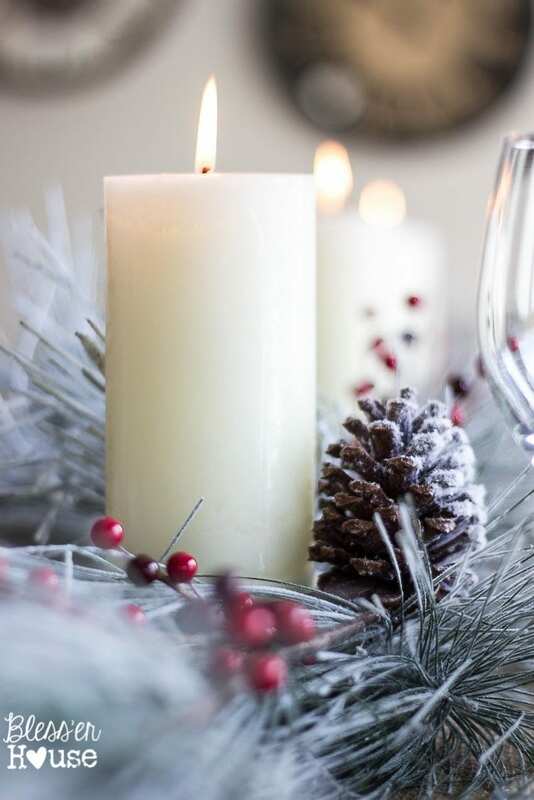 Blessings to you this holiday season! Absolutely gorgeous. 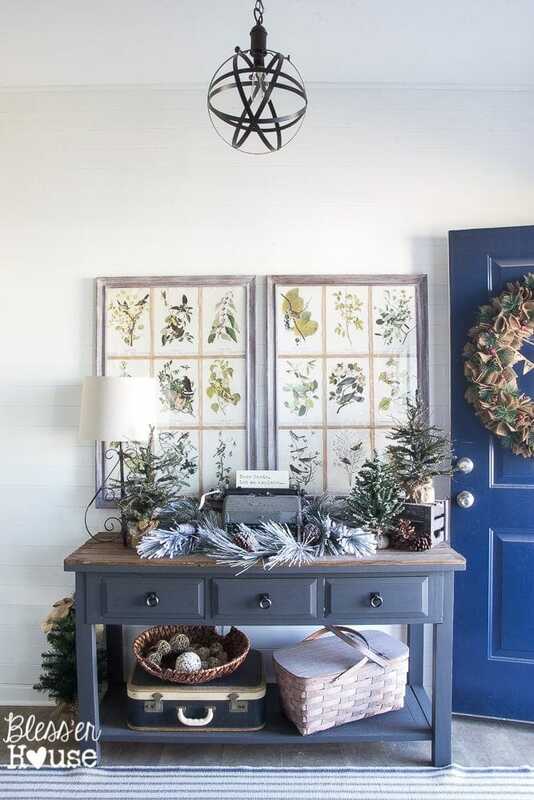 I love it all, but your mudroom is a fave. I think this may be my favorite post of yours EVER, and that is saying a lot!!! You have a knack for holiday decorating, sister. It’s lovely. All of it!!! Thanks so much, girlfriend! I was about to head over and check out your holiday tour in a minute since I just saw your IG post. It’s gonna be fab. I know it. Hope you and your fam have an awesome Christmas! Lauren it is beautiful. Bless your heart girl. You’ve managed to make a beautiful home on a budget and it doesn’t look that way at all. My favorite part of course is your Christmas tree. Actually the beauty of your house it that it is soooo full of personal touches. That’s what makes it so special. No cookie cutter here! I also play the nutcracker non stop in my house every year or it wouldn’t be Chritmas time for us. My kids are sick of it, lol but a tradition is a tradition. 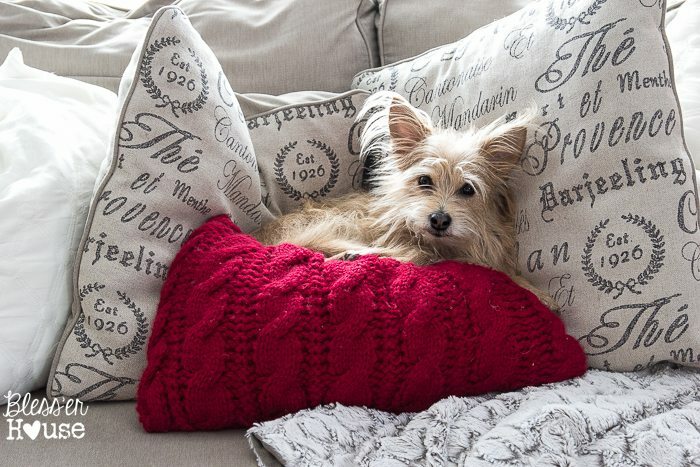 And Lola looks very content there by the red pillow. Lots of hugs from me and I wish you and yours a very Merry Christmas. Thank you soooo much, Mary! Lots of hugs right back at ya. I totally agree. It’s one thing to have a pretty, decorated house, but it’s the personal pieces with stories behind them that are worth more than anything a store could produce. Hope you have a very Merry Christmas too! So so beautiful, Lauren! Your home is cozy and gorgeous. 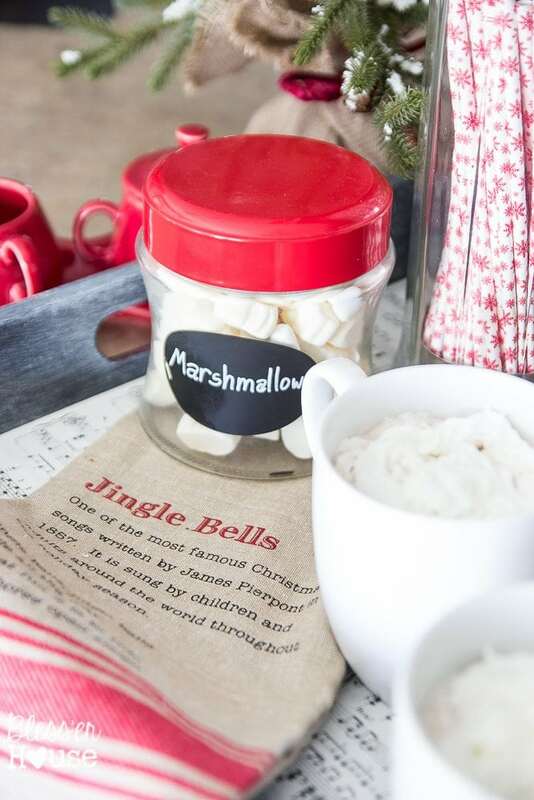 I’d like to come over for hot cocoa. 🙂 I love your blog, and I so appreciate your keeping the reason of the season alive. Blessing to your family this Christmas! Come on over, girl! We’ve got cocoa by the plenty. 😉 Thank you so much, Bethany. Hope you and yours have a lovely Christmas too. Absolutely GORGEOUS!! Oh my goodness, I can’t even choose a favorite thing, it’s all so pretty. 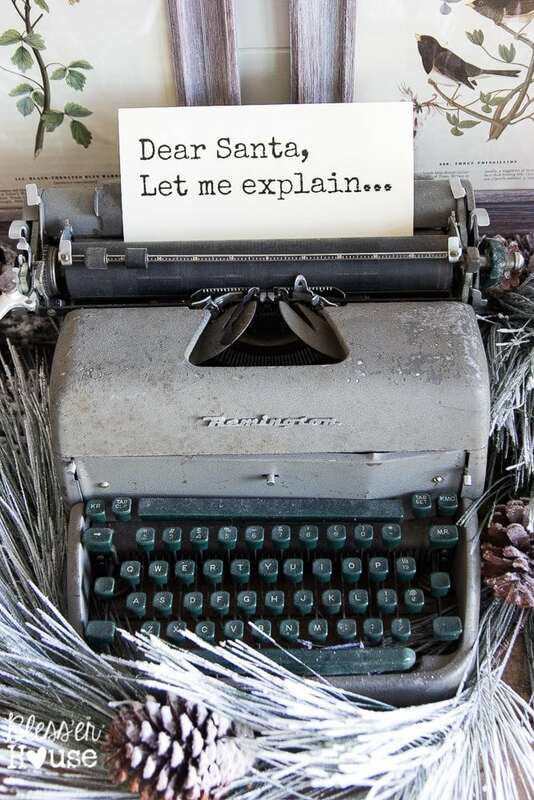 I love that vintage typewriter though – too clever! Well done in every way! 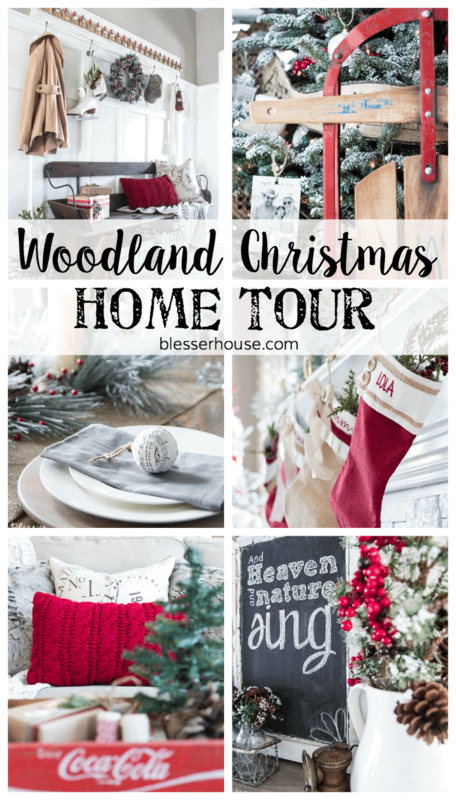 So glad i found your blog recently – in time for your Christmas Tour! Its beautiful and inspiring! I have been reading through so many of your past posts. 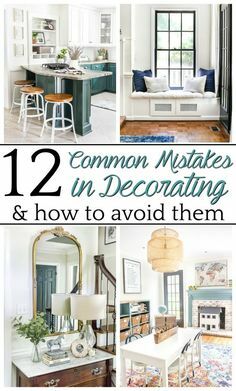 I love the one about finding your style, because the same thing happened to me a few years ago when we moved and i was pinning so many different things I didnt know where to start! You don’t know how happy that makes me, Amy! I am so glad you’re enjoying my little corner of the web over here. Thanks for the sweet words! Beautiful job Lauren! 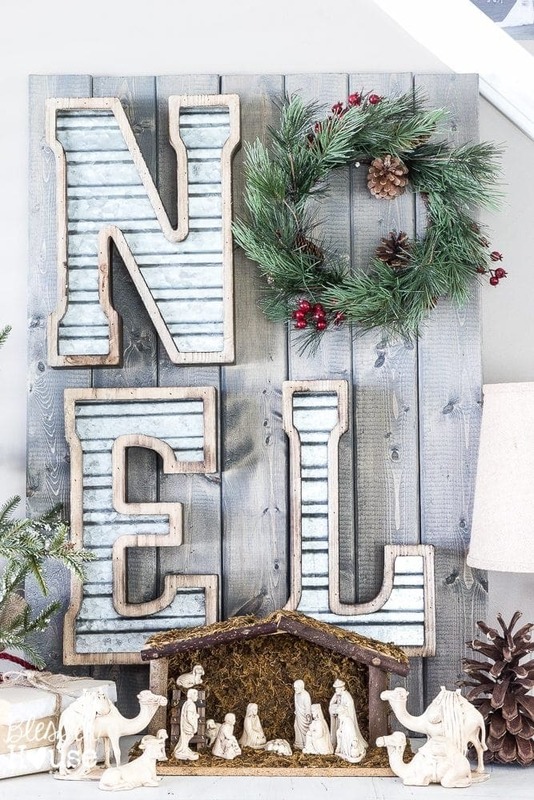 I am totally in love with the NOEL sign. Over the weekend I picked up three single wood shutters and now will be on a mission to paint and distress them to look that the fantastic ones you have 😉 Where did you find the pretty deer ribbon?!?! Thank you, Jamie! Your tour was so beautiful! Can’t wait to see your shutters. I already want more. Haha! I found the deer ribbon at Michaels. I tried to link it as a source but couldn’t find it online. I love how you incorporated so many meaningful things from your family! And that music ribbon is to die for!! What a fun tour! Thank you for sharing your holiday home! 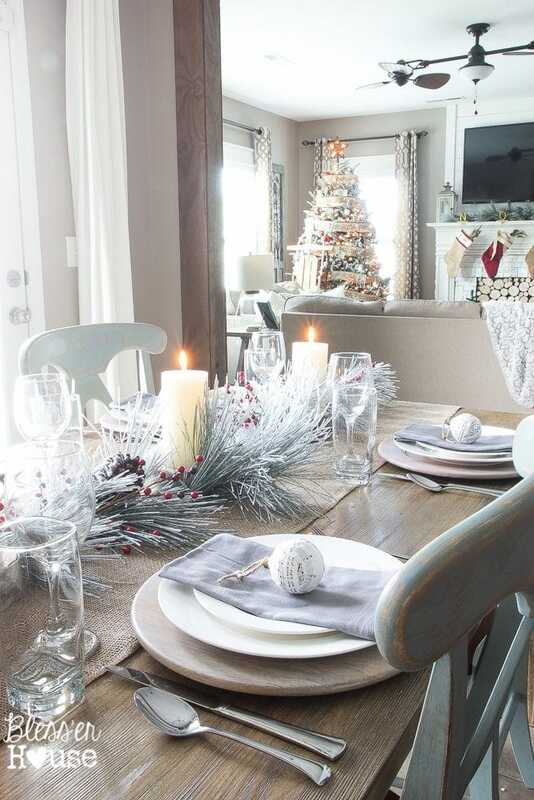 Love the frosty vibe with all the bright, white flocking and snow tipped garlands and such!! So very pretty. Your tour was a delight. Happy Holidays to you!! 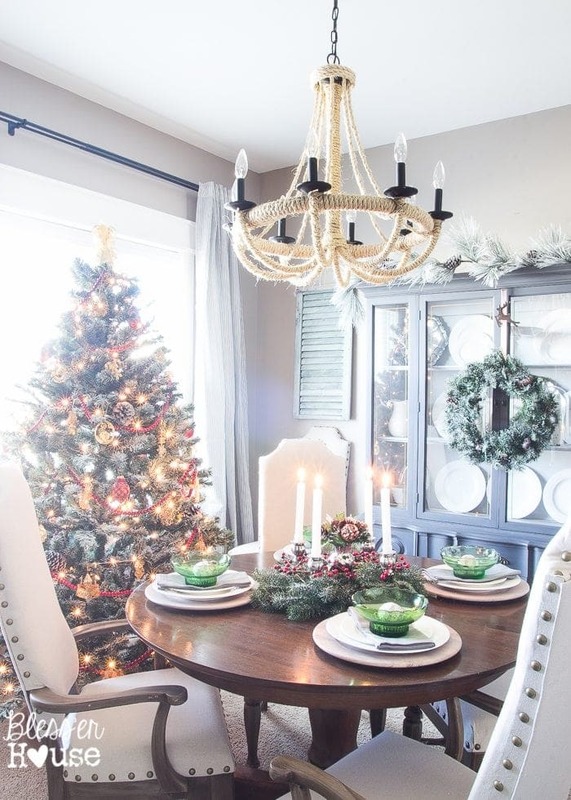 Your home is always lovely, Lauren, but especially pretty with the Christmas decor. 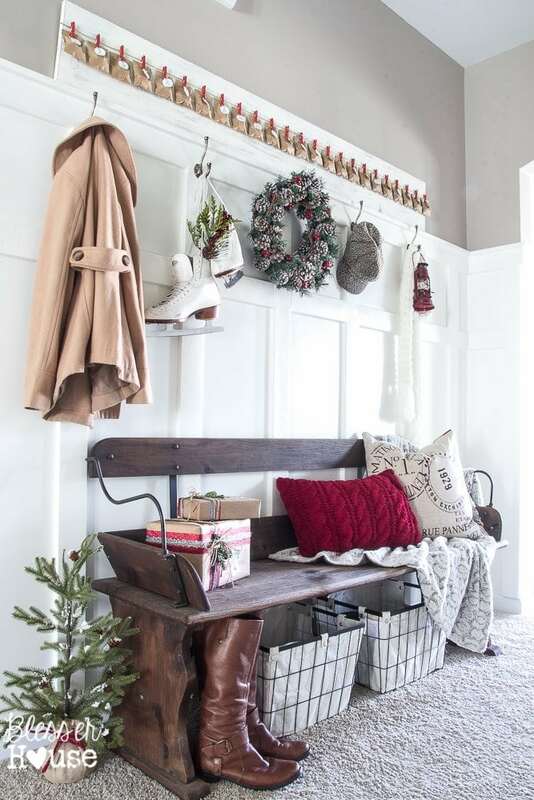 Your tree is very pretty and I really like how you styled the mudroom. Thanks for the tour and I hope your family enjoys this time leading up to Christmas. Thank you once again for working so hard early in the season so we your readers have inspiration (and admiration!) from all your hard work. I have so many little ideas I am pulling from your rooms and so glad to see red too. I decided to use red this year and most of my old various sizes and colors of moss balls with it. I’m never the same! I’m proud of your Christian witness and doing verses plus a treat for advent. Your Christian witness is so evident! 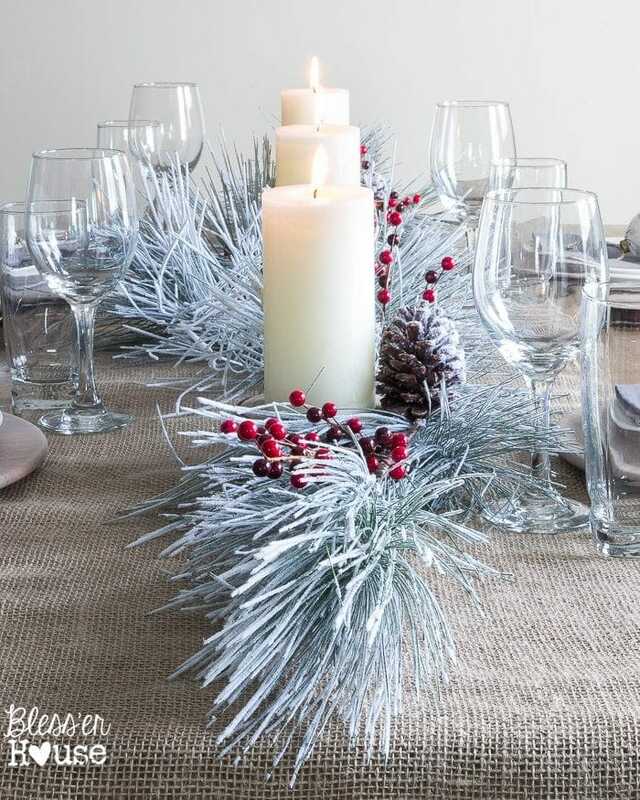 Thank you again for sharing your gift of decorating with us your readers. Delightfully written as well! Well done, Lauren. You home is just beautiful! I love how much you cherish all of the things from your childhood and things that were passed down to you from your grandparents and parents. Isn’t it awesome?! I couldn’t believe it. Hope you have a merry Christmas too, Melissa! 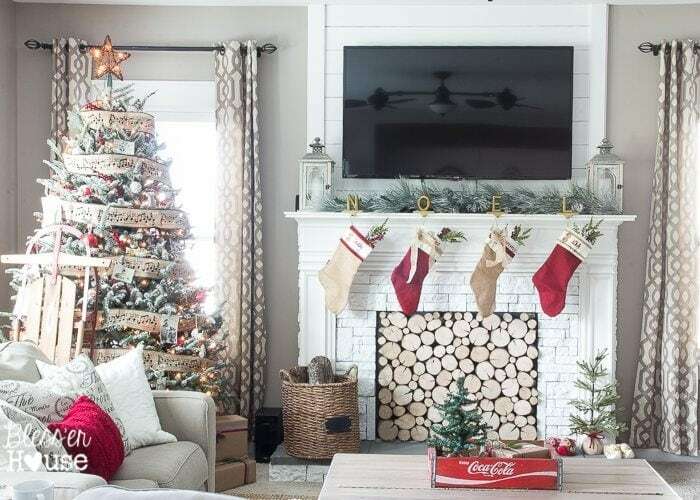 Your home is the perfect holiday modern country home!!! Inspiration in every corner, love how you made your home warm, welcoming and so beautiful at the same time! Glad to join you in the 12 days of Blogger tour!!!! Thank you so much, Vel! 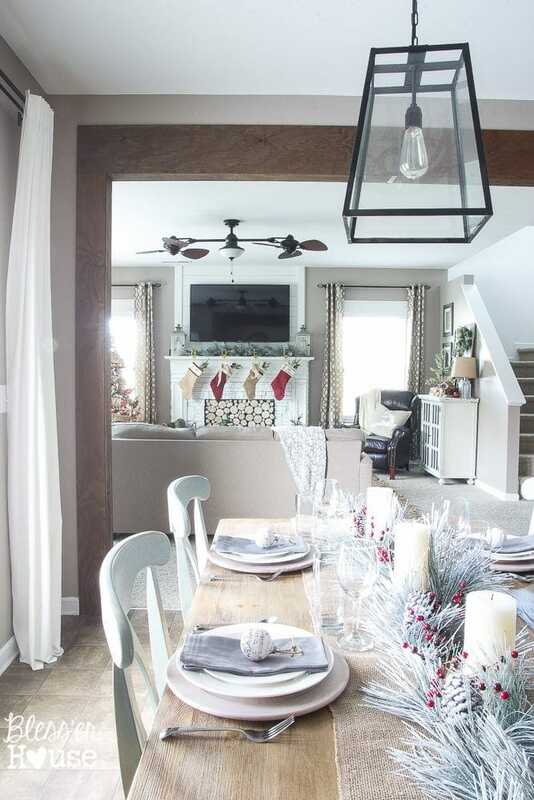 I love this time of year and seeing all of the beautiful home tours 🙂 I love everything about your faux fireplace, and the bench in your entry is amazing, I can’t believe it was only $35! AH! Your tour was beautiful, and I especially liked your chatter, felt like I got to know you a bit more- didn’t know you were also a dancer. My God! Your house is… is….. is….. no words…. Love EVERYTHING you did. Sure, I will take some ideas for mine! Thank you so much, Emanuela! You’re too sweet! Wow, it’s all so pretty and festive. You did a wonderful job. Lauren, this is absolutely amazing! Thank you for sharing every special detail. Thank you, Alison! You’re so sweet! Looks beautiful! Im a fan of your blog and style. Where are your curtains from in your family room? Thanks and Merry Christmas! Thank you, Crystal! The curtains are from Kirkland’s. What a stunning holiday home! I love your typewritter with a note in it. And I love all the greenery, too!! LOVE, LOVE LOVE! It’s all so beautiful and wonderfully cozy Lauren! Happy holidays my friend! Thank you so much, Kristi! Happy holidays to you too! 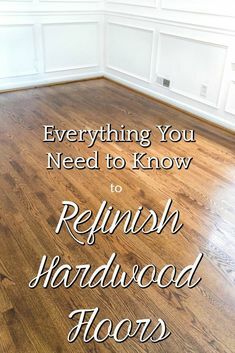 love every speck of your decor! It looks amazing. Especially that Noel sign, super cool. Merry Christmas! Thank you, Virginia! I was so in awe over your tour. Your tree is my absolute fave this year!!! Just amazing. So, so pretty, Lauren! 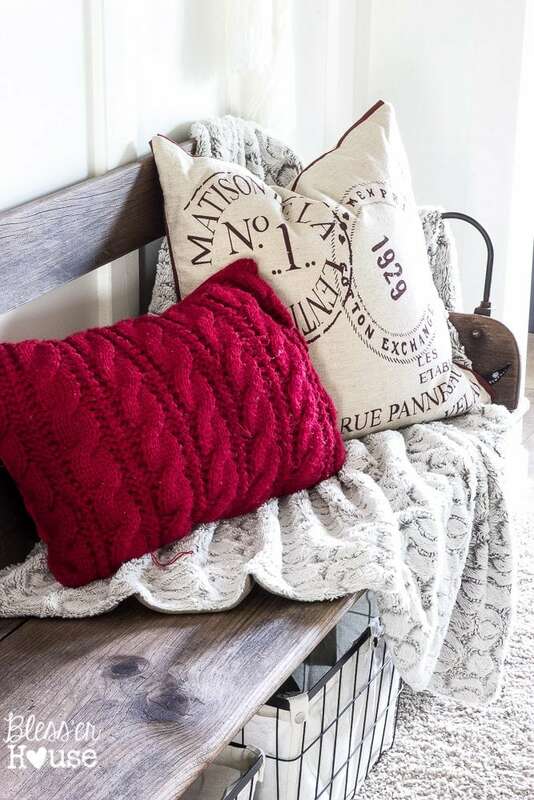 I love all the pops of red, it works so well with your neutrals! That tree, girl – GORGEOUS! I’m completely blushing, Maria! Thank you so much! Absolutely stunning Lauren. I have totally worn out my pinning finger. 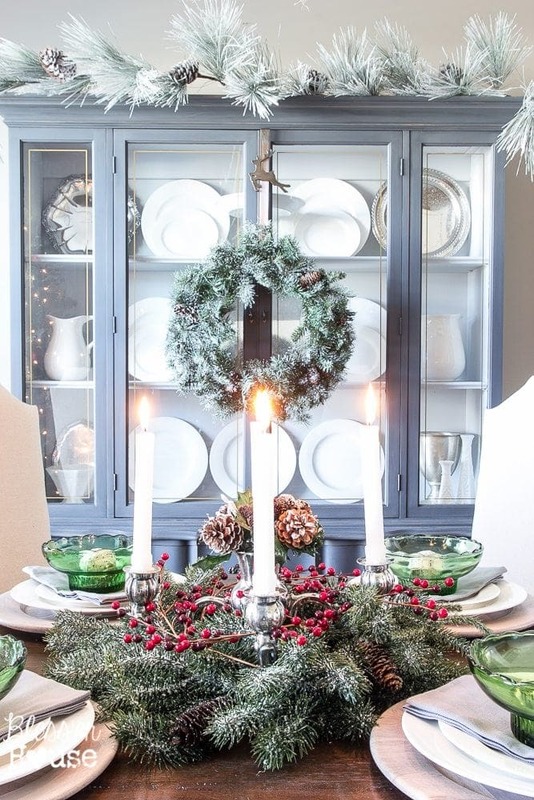 I love all your decorating and styling and your pictures are amaze-ing!! Fabulous, friend! Aw thank you, Krista! My day is completely made. 🙂 Hugs! I am in ? 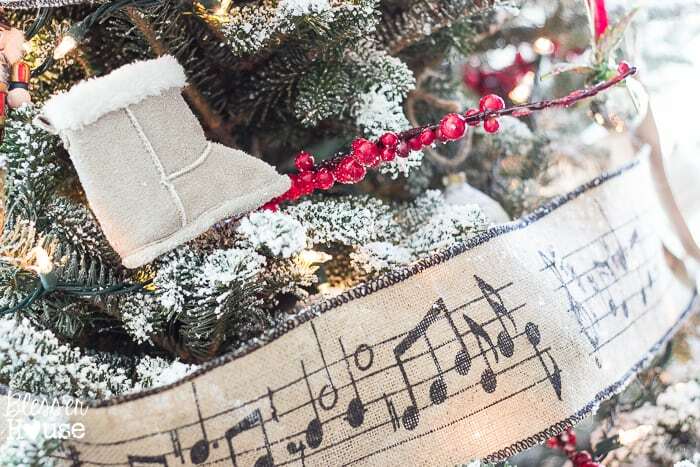 With all your lovely home decorations! I believe we share the same taste.since I was a kid my fave stores were Goodwill and The Salvation Army. I believe I have found the wall colors I want in our apartment in your blog and in your Instagram account! Just subscribed! Can you share the wall color and if you think a light ocean blue(accent wall) both in the living room n dining room. I have my eye that’s might be this one! God Bless and keep it up girl!!! ??? You have such a beautiful home, Lauren! And it is simply magical all decorated for Christmas! Thank you, Sarah! Hope you had a great Christmas! You’re so sweet, Beverly! Thank you! Love your house!! 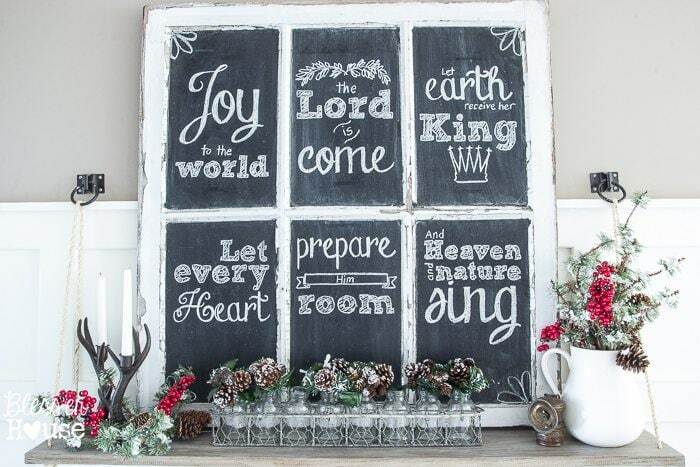 Would you be able to share the printable you used for the chalkboard window? I would be happy to purchase it! Thank you, Sallie! Oh, I wish I had thought to include a printable. But I no longer have the file since this was a year ago. If it helps, I made it on Picmonkey, so you can design your own there too for free if you wanted. I love your house. 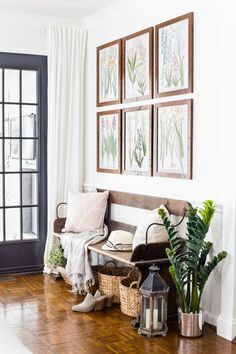 I have a question, where did you get your botanical prints in the entry way/foyer? Thank you, Jennifer! I got the botanical prints from an old Audubon book. I just ripped out the pages. But you can download them on the Audubon website in full resolution as well here: http://www.audubon.org/birds-of-america They are in the public domain. Lots of love put into your home. I can’t say which room was a favorite. Each was unique and beautiful. Thanks for sharing!